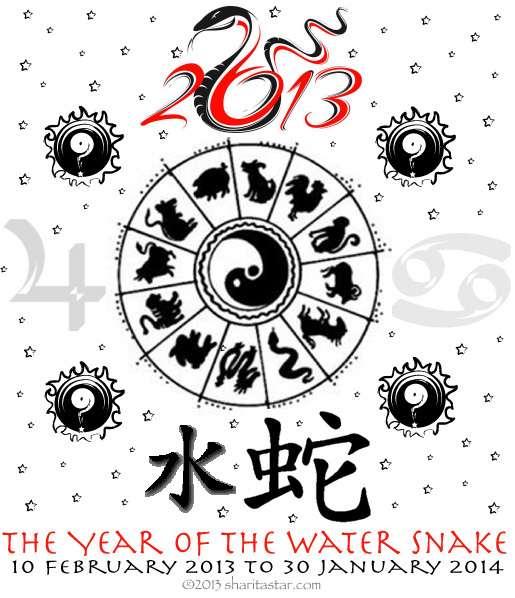 We collectively celebrate the Chinese New Year on the Aquarius New Moon 10 February 2013: The Year of the Snake/Water Year. The Chinese Zodiac can lend anyone valuable insight into their personality and natural tendencies, further enhancing what our Western Zodiac is able to provide. The intricate link that is the common ground of understanding to how the East and West relate is the transit of Jupiter -which takes approximately one year to pass through any Zodiac sign- resulting in a 12 year cycle to complete the entire Zodiac Wheel. Jupiter is the planet that represents where typically -if a sense of control and awareness are present- good luck, fortune, prosperity, growth and optimism will flow freely within the life as one examines the classic tropical astrology birth chart. From the East’s perception, during the current animal year that always begins upon an Aquarian New Moon until the next lunar pass of it, we will see the return of Jupiter to the zodiac sign it correlates to in the West’s astrology chart. Our friends in the East take their Zodiac and equally separate it into 12 signs as does Western Astrology. Here in the West it takes only one year to represent all 12 signs on our Zodiac wheel as our Sun passes through them month to month, relating to our change of seasons through cardinal, fixed and mutable energies represented within the elements of fire, earth, air and water. Our friends in the East take 60 years to complete a full cycle, as each animal every 12 years is depicted through 5 different elemental years of earth, metal, water, wood, and fire. Both the West and East honor the signs being masculine/yang or feminine/yin energy as well. The Snake –a yin fire animal- comes into Zodiac play for us for the first time since 1953-54 in a Water elemental year. Our last Snake year was 2001-02, where it was in a metal guided energy for the passage. While we are starting off 2013-14’s Year of the Water Snake under Jupiter in Gemini, by the early summer Jupiter enters Cancer, which is the transit associated with how we are best to identify what will transpire under the influence of the Snake. Snakes in the West are often professed to be dangerous, creepy and generally feared. This is not the case in the East. The Snake holds deep mystical symbolism and high esteem as an energy that helps one better understand the process of transformation along their spiritual journey in life. Honored as a source of sacredness, beauty and wisdom, snakes should not be underestimated in their somnolent and passive appearance. With minds that penetrate deeply, they possess an innate ability to listen and give rich advice, seeing beyond the surface and can perceive and discover all kinds of hidden truths. Typically curious, intelligent and reflective, Snakes are quite known to appreciate what the unknown can teach to them, and thoroughly enjoy sharing these secrets and any good advice with others. Now the collective experiences the 6th year within a 9 (2008 to 2016) and 12-year cycle (Year of the Rat, 2008 to Year of the Pig, 2019) where the seeds planted in 2008 are seeing a state of balance returning after all of 2012’s permanent changes. After the midway point of the current collective 9 yr span has passed, we also have now reached the halfway mark around the Chinese Zodiac Wheel, as a transformative year speaks before the next half begins in 2014. Strengthening compassion and understanding within our relationships and especially family ties throughout the present year aides in the eventual collective harvest, just a couple more years further down the road in 2015. With Venus guiding the singular 6’s energy over 2013, there is plenty of harmony, contemplation, peace and justice to be found amongst the Snakes’ urges for deep philosophical ponderings which dive into morality. 2013 marks the time where seeing both sides of the issues at hand make for brilliant perceptions to be discovered, as mankind is wise to step into his heart space to better comprehend his reason for being here at this time upon the earth. The collective can expect this to be a time of karmic experiences offering up regeneration and change wherein balance is restored from them. Honest acts are rewarded, while those handling hurtful secrets will find them being exposed. Attention placed upon self-renewal is favored, and the adaptation to the attitude of grace under any kind of pressure will prevail over anxious reactions. Working efficiently and economically brings serenity, for duplicity is present for this passage, and remembering to keep an eye on every detail while taking less gambles brings buoyancy in financial dealings. An intuitive intelligence is easily available to anyone willing to better understand the soul’s process and purpose. Matters of morality strongly become a focal point, as questions get asked and the answers appear to further understanding for humanity. It is an auspicious year within The Water Snake for the arts to especially nurture these ideals and create works that provide profound insight for the human cause. Life in a Water Snake Year evokes the nature of an instinctive presence that taps us into an imaginative mood for the collective. Especially once Jupiter enters Cancer in early July, we will have 3 outer planets in water signs. Upon 17 July as Jupiter in Cancer reaches 04 degrees, it makes a Grand Trine to Saturn at 04 degrees Scorpio and Neptune at 04 degrees Pisces. At this 04 degree mark, be ready for innovative, original, and break-through sensations to stream into where your water sign points align in the Zodiac Pie. While Neptune will hold back in the early degrees of Pisces, Jupiter and Saturn meet up later upon 12 December at 18 degrees for another exact trine between Cancer and Scorpio, drawing upon more conclusions that propel us to hone in further upon spiritual means over materialistic gains driven by ego. These planetary meet-ups promise to offer the potential for the collective to get happy about breaking through to a deep and rich inspiration that will aide in awakening to further truths that can steady success, as long as eyes are open and responsible to ways that are wise and just. With the Snake representing Yin Fire energy, what transpires over the year ahead brings forth profound reflection, coupled with a dynamic sympathetic understanding about our lives. Heralding transformation within our state of feeling, we can unite what has been divided in our outer world for far too long in order to continue living life the way it can be embraced with mysticism and enthusiasm as our guiding lights. The Snake is the considered an extremely karmic Chinese animal and holds intense symbolism upon their Zodiac Wheel. They firmly believe that those born in a Snake year, incarnate to balance out whatever past life karma is left unsettled to free the soul. Snakes are easy to handle problems that may come their way, and are rare to subscribe to letting whatever they must overcome get them down. Innate advice givers -but not always the ones to easily receive it- these Spirits are here to generously help others in their deep thinking and perceptive ways. When they follow the path of warmth, comforting others, and protection, they find love and respect; while if they slither towards actions in life that breed suspicion, vengeful or crafty results, they find cruelty and intolerance instead. So too, will these principles exist and persist within this Chinese Zodiac Year, so remember the wiser ways of the Snake and one will prevail. As we look to add some Lexigram insight as we examine the very title of ‘THE YEAR OF THE WATER SNAKE’ we find, uncannily enough, the truth can be spelled out from the very letters composing it. In the simplicity of the SNAKE alone, it is wise to not gravitate to actions that result in being a SNEAK in the year ahead, for then one will miss the gifts that this year is meant to bestow upon those that take up in matters of the HEART, which reflects in further healing for our dear EARTH. AS ONE EARNS THE TONES OF THE SNAKE, THEY EARN THE TOKEN NOTES TO SOAR AS THE YEAR OF THE HORSE ENTERS. DID YOU KNOW??? SNAKE TRIVA! You are in the company of a Snake when you see an elegant, profound, sophisticated, and sensual spirit that efficiency shows that life is to be valued by living every day in contemplation that leads to more self-awareness. Unlike the “scary” norm, a person born to this year: is subtle, is at times seductive, enjoys time in analysis, makes their home their favorite place so they can imagine and remain in peace, excels at adaptation, exudes intensity and passion, prefers to work efficiently so they can have time to relax, possesses an innate understanding of morality, dislikes fake anything- seeing through all that is not genuine, avoids lending money or dealing with superficial people. The internal feminine combines with the spirit and inspiration, resulting in the excitement that these natives have about offering up uncanny advice. The energy of fire allows for an attractive urge to be eager to please others within the nurturing Yin. A Snake can become unbalanced when they do not find themselves to be motivated- without any moral or material inspiration, they coil up into a reflective state that others view as lazy, and withdrawal from the world. The Snake’s energy marks a universal time for expansion upon our ability to perceive what cannot be seen alongside nurturing what we already have with efficiency. Financial matters of all kinds but especially those surrounding food, real estate and charities prosper when scrutiny and honesty are respected. Those holding to secrets that are in harmful intentions will become exposed, wherein more often than not, even though the TRUTH will HURT, it will bring forward an ultimate transformation to set one free. A dynamic year for the metaphysical fields and artistic pleasures, those who seek to give sound advice for humanity’s prosperity, benefit and morality are the victors. 1905, 1917, 1929, 1941, 1953, 1965, 1977, 1989, 2001, all saw growth and forceful changes within these areas on a global level, as will 2013, as along as intuition is carefully listened to with the Water energy guiding this particular year. *The Chinese New Year is always celebrated upon an Aquarian New Moon here in the West, as it yearly cycle ends upon the next one in the following year.